The democrat canvassers are out knocking on doors for the November election and I am disgusted by what they are telling the voters. When discussing the Sheriff’s race in Summit County, the canvasser said, “The other choice is really frightening,” alluding to Republican Candidate for Sheriff, Derek Woodman. Really, frightening? Really? Derek Woodman represents Dedication, Proven Leadership, Integrity, Loyalty and Experience. Let me tell you what’s really frightening; the current democrat in the office of Sheriff, Jaime (John, Jack) FitzSimons, and his sketchy history. It’s really frightening that Jaime FitzSimons was kicked out of high school, not just once, but twice! First from a Catholic Parochial School, and then University High School. It’s really frightening that Jamie FitzSimons is a drug/alcohol addict who spent time in Sierra Tucson rehabilitation center in Tucson Arizona, only to relapse numerous times. It’s really frightening that the LAPD was called on several occasions for domestic violence complaints against Jaime FitzSimons. It’s really frightening that Jaime FitzSimons was sued for the death of his mistress, Nadine Arango. It’s really frightening that Jaime FitzSimons was sued for sexual harassment by his subordinates. It’s really frightening that Jaime FitzSimons has had several extra-marital affairs. It’s really frightening that Jaime FitzSimons, after being ordered by his commanders at LAPD to stay away from his subordinate, girlfriend, Nadine Arango, he continued pursuing their relationship and stalking Nadine Arango. It’s really frightening that Jaime FitzSimons was fired from LAPD for insubordination, misconduct and failure to follow direct orders. It’s really frightening that there has been an 80% turnover in the sheriff’s office since Jaime FitzSimons has been in office. It’s really frightening that Jaime FitzSimons continues to be dishonest with the Summit County community. It’s really frightening that Jaime FitzSimons is dodging responsibility regarding the deaths of jail inmates, James Durkee, Zachary Moffit, and Jacqueline Bickford by lying and stating in the November 17, 2017 SDN article that he was a deputy at the time of the incidents and not involved in the jail, when in fact he was a captain for the sheriff’s office (which he stated in the SDN article on April 10, 2008). Summit County! Get informed! Ask questions, get honest answers. Do your research! Jaime FitzSimons is NOT the right person to be the Summit County Sheriff! Make the right choice in November and vote DEREK WOODMAN for Summit County Sheriff. Ty Odle, Western Slope Extractions, reports that acreage might have been higher had growers not faced the uncertainty of water to irrigate their crops this year. “The drought kept quite a few people from growing, knowing they would likely run out of water early,” Odle said. After the plants are harvested, they’re dried and stripped of the buds and leaves, which are sent to a processing facility like Odle’s. Some processors buy the product outright; others do a split, meaning they keep a portion of the oil in exchange for their services. Most new growers — meaning most of the folks Odle works with — don’t have the contacts to sell their oil once it’s been extracted, so he helps with that aspect as well. He also provides a “white label” program, making retail products for the growers to sell themselves. He said he’s been visited by a processor from the Front Range, and from California investors who would like to help him expand his operation. But he’s content to grow his operation slowly, learning as he goes and keeping risk at a minimum. 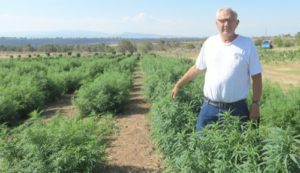 Mason said five acres is as large as he’s willing to go, due largely to the cost of plants but also taking into account how labor intensive hemp can be. He said he wound up pulling weeds by hand, so next year he’ll be looking for an easier option. Some growers lay down plastic in the rows between plants, but he’s seen the wind pick up the plastic, along with the drip system, and whip it around through the plants. He and other growers would like to see the THC level raised to 1 percent. “Then almost all varieties would pass and we wouldn’t have to harvest early,” Mason said, explaining that the higher the THC, the higher the level of CBD oil. There’s currently a lot of research going into plant varieties, with the goal of keeping the THC low while maximizing the CBD levels. The latest thing from Oregon is a variety known as “cherry wine,” a variety that Mason plans to start indoors over the winter. “There’s a whole lot of energy going into hemp, and what you can do with it,” he said. “It’s growing by leaps and bounds because it’s so effective,” Mason said. CBD oil is also touted as an effective treatment for anxiety and depression, inflammation from arthritis, sleep disorders … even acne (healthline.com).